Yesterday I met up with my father in Toronto and we attended the Art Gallery of Ontario (AGO). I had never been before and there was a collection on loan from the Museum of Modern Art in New York which he was adamant about seeing. The feature was called “Abstract Expressionist New York,” and I would recommend it for anyone who likes to have no idea what they are looking at. 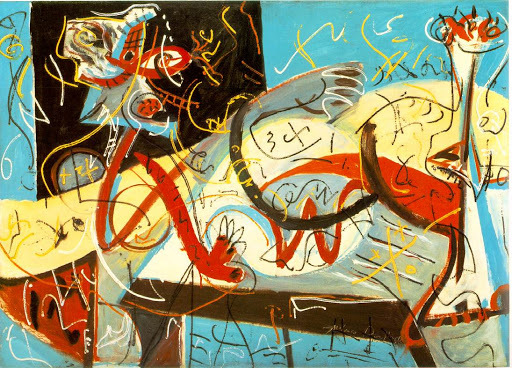 Among these American Expressionists, or The Irascibles as the program called them, the most well known was probably Jackson Pollock. I approached this painting with a kind of “alright, let’s see what all the fuss is about” attitude and proceeded to stand rapt in front of it for about five minutes just taking it all in. I admit that I stood there partly because I had the sense that I should really try and appreciate something so famous, but there was also a genuine attraction to it. Something about the painting was just so much more than a Tremclad Golgothan having diarrhea on canvas; it spoke to me in a way I can’t explain. And what people who see pictures of the painting can not appreciate is that the textures and three-dimensional aspects have so much to contribute to the overall experience. For example, certain big globs of paint were poured onto the painting and left to dry as such leaving a protruding blob. Another thing which caught my eye was the smear of magenta in the bottom left corner. I started looking for more traces of this colour throughout the rest of the painting but was unable to find any which gave rise to a certain curiosity in me regarding Pollock’s choice to use it so sparingly. Overall I can not say that the painting elicited a particular, nameable emotion but it had my attention, and with a nondescript name like Number 1A, 1948, that’s all the painting asked of me. I spent a good deal of time examining this painting and the two weird robot-looking people looking like they are having an argument within. To begin with I wasn’t aware that Pollock had strayed much beyond his drip-painting technique so this challenged my expectations. Secondly, to me there is an aspect of the future in this painting (maybe than for no other reason than the characters in it look vaguely like automatons) and futurism is a genre/style which appeals to me. The use of colour more than the textures caught my eye in this instance (but again, sadly, google images does not do it justice): To put it into perspective, in a room full of Pollock’s masterpieces, this one commanded my attention. 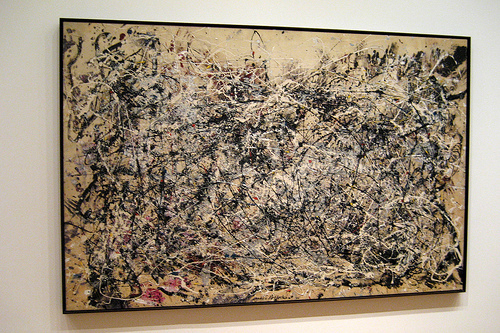 I think I have a greater respect for Pollock than I did earlier. I suppose I always suspected that there was something to his work which had to be appreciated firsthand. Having now seen some of it I can attest to this fact. Remember, a ticket to an art gallery is never money wasted. usurped our individual free will and sovereign authority in the past and continues to do so today.